"A modern day thrill ride, where a teen girl and her animal companion must participate in a breathtaking race to save her brother's life—and her own. It says a lot about a book when you finish it in less than half a day. The sheer suspense, adventure, enthusiasm and laughs had me glued to my seat! No time is wasted from the beginning in getting into action as we follow Tella’s quick decision to obtain a cure for her brother by entering the Brimstone Bleed. People of all different ages, shapes and backgrounds are entering this competition to obtain a cure for a sick loved one. This competition will take them through several months of survival in the most extreme conditions. As they come to know and care for one another, the question arises of why are all these loved ones sick in the first place.In an adventure that rings in the survival tales of The Hunger Games and the companionship trials of Pokémon, Fire and Flood shows how far people will go for The Cure. The overall idea of the plot may not be completely original, but the authors writing style and individual concepts were. I love the idea of Pandora’s and imagined them as little pokémons defending their masters. I was intrigued with how imaginative this story was, and just how diversified everyone’s Pandora was. The relationship between Tella and Guy is great and everything, but even after the end revelation, I still think she should keep up her guard, because everybody involved in the Brimstone Bleed has a sick loved one that needs curing. People will do anything if the need is great enough. I am enthralled with Titus, not as a person, but as a character who poses a real threat. Not just in attitude and egotism, but in a sleazy and even abusive way that gives him more relevance and credence as a modern-day obstacle. In all I quite enjoyed Fire & Flood, with not only it’s concepts, but the author’s writing voice as well. I’m already a fan of Victoria Scott’s Dante Walker series, and now I can add this series to the list. 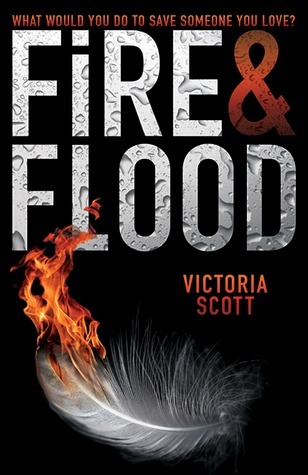 I’m eagerly awaiting the next in the Fire & Flood series.